The Huntsman Center has a lot of empty seats lately. What are the Utes doing to change that? Utah AD Mark Harlan’s staff is trying to jazz up game presentation to attract fans. 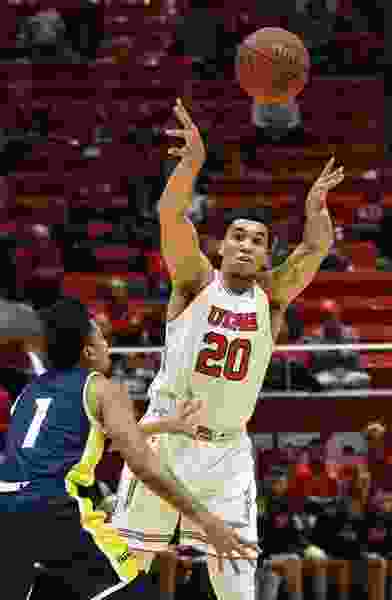 (Francisco Kjolseth | The Salt Lake Tribune) Utah Utes forward Timmy Allen (20) fins an opening past Northern Arizona Lumberjacks guard Davon Bolton (1) during a game at the Huntsman Center in December. Behind him: a sea of empty seats. The Utes, like many other men's college basketball teams, are struggling with attendance declines. Utah's next men's basketball game comes in the middle of the NFL's conference championship doubleheader, making attendance even more of a challenge than for an ordinary Sunday event at the 15,000-seat Jon M. Huntsman Center. How many fans will be in the arena for Utah's game vs. Colorado? Not as many as the announced number, that much is certain. As is standard practice in the industry, Utah's official figure is the number of tickets distributed. That explains why the Utes could list attendance of nearly 11,000 for selected games in November, when black curtains were draped over the Huntsman Center's 7,000-seat upper bowl. The Utes are fighting against the factors that all schools face these days, when every game is televised, tipoff times are inconsistent and the NCAA Tournament overshadows the regular season — especially non-conference games. Athletic director Mark Harlan is trying to create more entertainment value through game-presentation elements such as music and use of the video board, appealing to fans who currently find it more convenient to stay home and students who have other interests and demands on their time. The Utes have supportive, knowledgable fans and interest remained high in the program going into 2018-19, judging by an increase in season-ticket sales to 6,896. This season’s problem, not unique to Utah, is how many of those tickets are going unused. For last weekend’s game vs. Washington State, only 5,943 tickets were scanned — amid the announced attendance of 11,358. The actual number of people in the building was somewhere in between. The number of basketball games, compared with football, tends to devalue each of them. Fans are far less deterred by late kickoff times in football than by inconvenient tipoff times in basketball on weeknights, especially. Basketball fans are more conditional than in football, where Utah has sold out every game of the school’s Pac-12 era. Utah’s support in men’s basketball this decade peaked in 2015-16, when a senior-driven team was was coming off an NCAA Sweet 16 appearance and earned a No. 3 seed in the tournament. With a young team in 2018-19, Utah is lagging behind last season’s average of 11,710. Sunday’s marketing challenges aside, though, Utah has a good chance of increasing its published average of 11,168 in the six Pac-12 home games that will follow. All of those games are scheduled in Thursday-Saturday sequences, although tipoff times vary. “If the team was more competitive, like in a position to win the conference or make the [NCAA] tournament, I'd be more motivated to work around the weird times,” Ute fan Aaron Vessel said. In November and December, unfamiliar opponents are a tough sell. “Your fans don't recognize Mississippi Valley State and Florida A&M, they just don't,” Kull acknowledged. That's why the curtains were pulled down for those games, as for women's basketball and volleyball. Fans responded well to a visit from then-No. 6 Nevada in late December (announced attendance: 12,835), even with many football backers having traveled to San Diego for the Holiday Bowl. That's true. Arizona is the only Pac-12 campus where college basketball remains a high priority for fans, partly because most other schools are in NBA markets. Colorado is trending toward the lowest attendance of coach Tad Boyle's nine seasons, according to the Boulder Daily Camera. The crowd of 6,184 for a Jan. 10 win over Washington State was Colorado's smallest for any Pac-12 game since the Buffaloes joined the conference in 2011-12. Student interest is dwindling at CU and elsewhere,with the likes of USC and Washington State drawing ridiculously low numbers. The Ute administration is doing some creative things itself. With a women's basketball team that's on the verge of a Top 25 ranking, Utah this week offered a $10, lower-bowl package for both Friday's women's game and Sunday's men's game. And federal government employees were offered up to six free tickets to Sunday's game. The only condition? That the tickets actually get used. Records: Colorado 10-6 (1-3 Pac-12); Utah 8-8 (2-2 Pac-12). Series history: Colorado leads, 27-22. Last meeting: Utah 64, Colorado 54 (2018). About the Buffaloes: Colorado has lost on its last six annual visits to the Huntsman Center and is 3-9 vs. Utah since winning all three meetings in 2011-12, both schools' first season in the Pac-12. … The Buffs have some injury issues, with point guard McKinley Wright having dislocated his shoulder in last Saturday’s 77-70 loss to Washington and forward Namon Wright having missed three games with a foot injury. … Forward Tyler Bey averages 12.0 points and 9.0 rebounds. About the Utes: Utah had six double-figures scorers in an 88-70 win over Washington State on Jan. 12, as freshman forward Timmy Allen posted 15 points and nine rebounds … The other times this season when the Utes had a full week between games, they lost to BYU (74-59) and Kentucky (88-61). … Utah’s kenpom.com efficiency rankings are No. 36 in offense and No. 278 in defense. … Senior guard Parker Van Dyke is shooting 40 percent from 3-point range.